Since I learned from a renowned physician that red cabbage is the number 1 bargain antioxidant vegetable, a red cabbage stir fry was overdue. 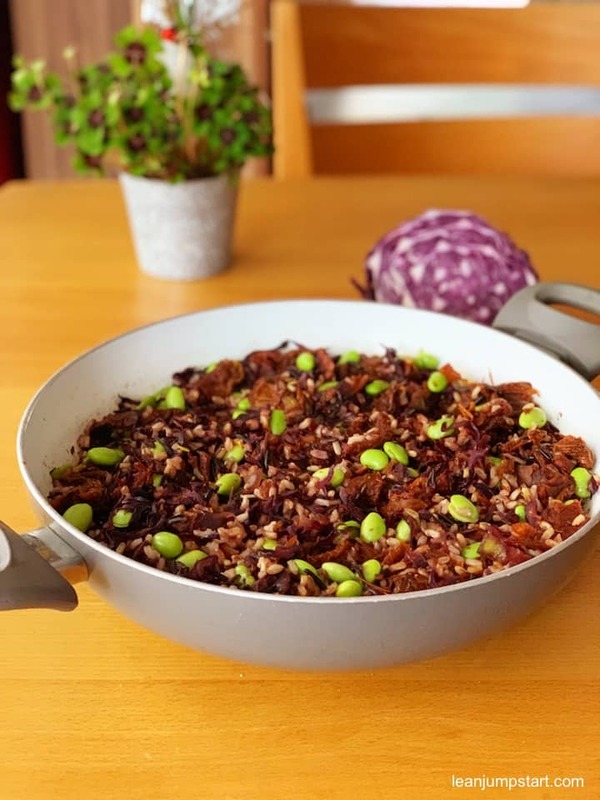 So here comes my first “warm” clean eating recipe with this purple cruciferous vegetable playing the main role. I’m sure you’ll love the fact that this delicious vegan dish can be ready within 20 minutes. The only premise is that you have cooked brown rice at hand. And if not, I’ll give you a tip below how to speed up cooking time. Read on! If you don’t have cooked brown rice at hand, you could easily use bulgur instead which can be cooked in a breeze. Just cover it with boiled salted water and let it sit for 20 minutes. Don’t tell me now that this important whole grain is missing in your pantry?! This coarse wheat meal is full of dietary fibers, which make you longer satiated. Other substances in bulgur can calm the nerves and regulate blood sugar levels. 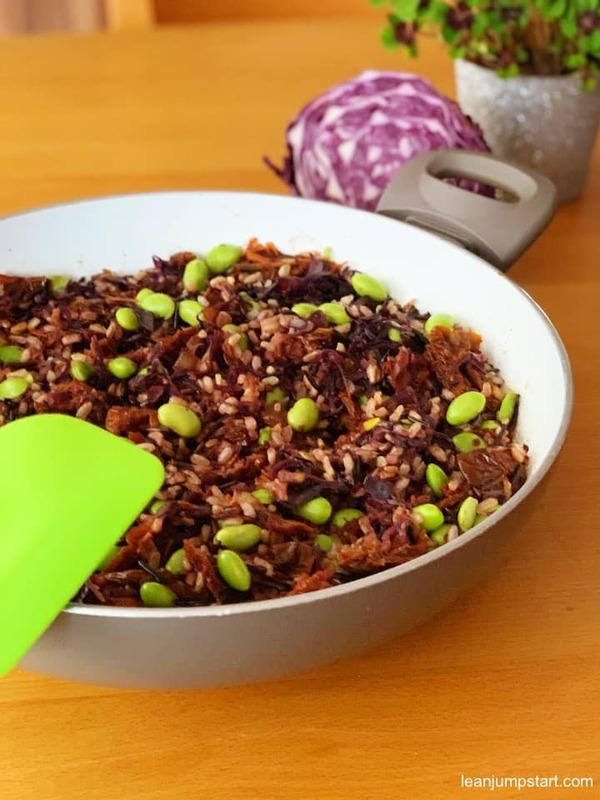 If you have plenty of time click through to learn how to cook brown rice on the stove for perfect side dishes. Ok, back to the stir-fried cabbage dish. As you can see it is an easy and colorful one-pan meal. While I’m jotting down this blog post I realize that there might be another ingredient not all of you have at hand: dried tomatoes. You can maybe skip the edamame, but it’s the dry tomatoes that give this flavorful dish the ultimate kick. By the way, did you know that dried tomatoes are high in fiber, antioxidants, and proteins? They are available either in jars with oil, but even better if you can get oil-free sun-dried tomatoes in resealable bags to keep this recipe as light as possible. I don’t know about the US, but imagine, here in Germany I can purchase little bags with oil-free sun-dried tomatoes even at Aldi! Heads up regarding seasoning. Sun-dried tomatoes are usually salty, so you often won’t need any additional seasoning for this dish. Don’t tell me that I didn’t warn you, especially if you have to watch your sodium intake. Heat olive oil in a frying pan and sauté onions for 1 minute. Add the cabbage and fry for 5 minutes at medium-high heat. Add garlic and turmeric and fry for another minute. Add cooked rice and frozen edamame, stir fry for 3 minutes. Then add dried tomatoes, oregano, soy sauce, and chopped basil. Tip: Don’t go overboard with the salt as the dried tomatoes are usually salty. For an Asian touch sprinkle with some sesame oil and sesame seeds at the end of cooking. Instead of edamame, you could also use 100 grams of frozen split peas which you add together with the cooked brown rice. If you love red cabbage but you don’t know what else to do with it, you’ve come to the right place. Some time ago I’ve posted a vitamin-rich salad recipe with purple cabbage and carrots including a secret ingredient. I’m sure you’ll enjoy it too. In this blog post, I’ve also put together the top benefits of this cruciferous vegetable. 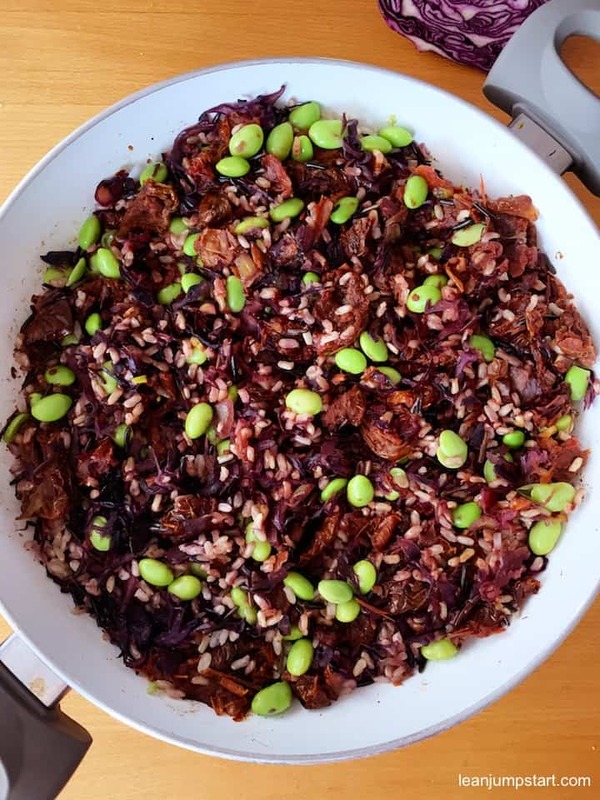 Click through for the clean eating red cabbage salad recipe. This is my kind of recipe! Looks so delicious! I am going to have to give this a try! Thank you Juli. Just give this easy and tasty one-pan meal a try, I’m sure you won’t regret it. Perfect for Meatless Mondays. So yummy! 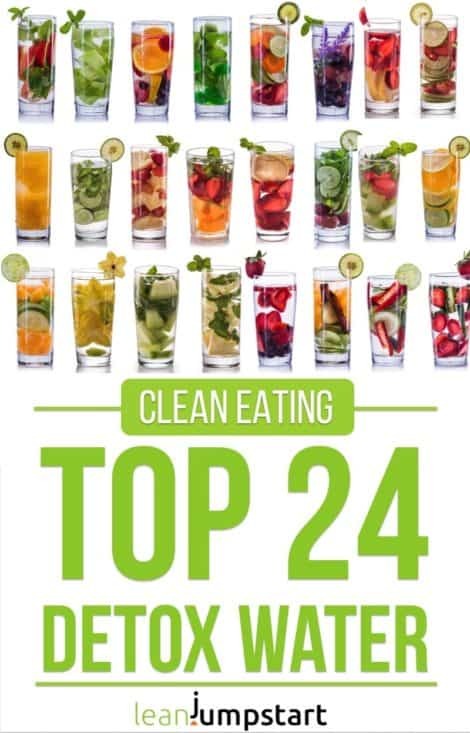 Vegan & clean — a good way to start the new year. 🙂 This looks great and yes, I bet those sun-dried tomatoes add to it perfectly. Sounds delicious. 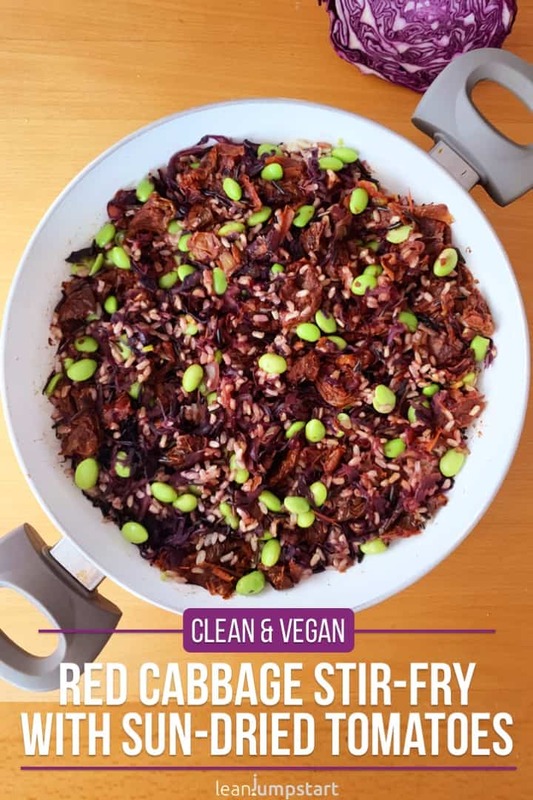 If your new year’s resolutions are vegan and clean then this tasty recipe is for sure a keeper. What a delicious flavour packed dish. I love anything that has sun-dried tomatoes in it. Me too Dannii!!! I sometimes think I must have lived under a rock for many years because I’ve started to cook with sun-dried tomatoes only a few years ago.